Over a period of two months, we tested METABOND products on a Volvo FH13 lorry that had been driven 275,800 miles. The average fuel consumption before the test was 6.9 miles per gallon. After 3,000 miles, fuel economy had increased to 7.5 miles per gallon. In addition, we observed improved torque, reduced noise and vibrations in the cab. Using a second vehicle, a Volvo FH16 with 680 hp that is used to transport logs on muddy roads, we noted an improvement in fuel economy of 8% to 10%. As the owner of a Ford dealership in northwestern Switzerland, I am also an enthusiastic driver in the Ford Fiesta Cup. Unfortunately I had one of the weakest cars in the field. It was impossible for me to overtake a competitor once I was in his slipstream. Thanks to a friend, I became aware of METABOND. Before using METABOND, I had my car tested for performance on a MAHA test block. The result: a maximum of 46 kW on the wheel. After adding 5% METABOND to the engine and transmission oil I noticed a significant improvement in performance. After 500 driven km, I took the car back for a second test. The result confirmed my positive impression: a top performance of 52 kW. The improvement came about without any modification to the engine, which was sealed for the races. Metabond products have been tested on different engines and fields of usage. 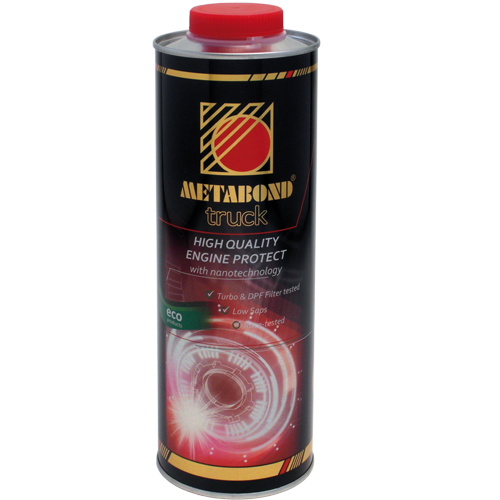 The trials have shown some very remarkable results Metabond oil additive has been extensively tested in a formula 1 engine (Judd-Brabham), a 250 cc turbo motorbike engine, also in a Chevrolet 4 valve Engine and on our own engine tested. 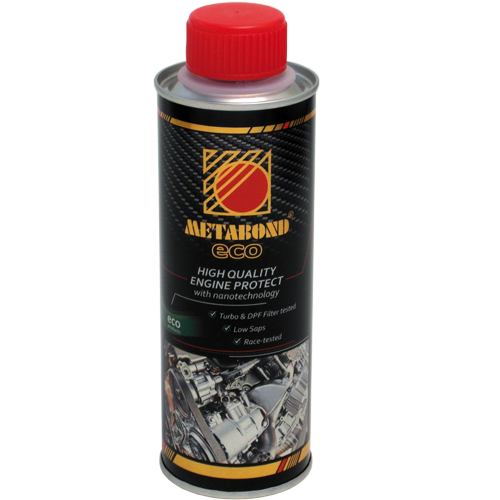 Thanks to the extreme lubricity of Metabond oil additive we have been able to perform the test even on the formula 1 engine with salad oil which has a very low viscosity. Amazingly 2 5 of power increase haven noted. The 250cc engine is an own design for the motorbike world championship with an engine output per liter above 800 hp. The engine had less surface damage even with 16’000 rpm. The Chevrolet engine was modified by us (cylinder heads). Metabond was added in the prototype stage for additional protection. The test runs all went well, without the usual problems caused in prototype stage. On a daily trial basis, we tested two BMW 3 and 5 series. (Engine, gearbox, rear axle, wheal bearing and the cardan shaft). Comparing the findings after 500 km, we found 4 % increased efficiency on the wheel. Customer’s vehicle: 2011 Audi 3.0 Tdi , 38,000 km. Motor-oil consumption was unusually high: every 3,000 km the car needed 2.5 liters! After two months and 6,500 km, oil consumption dropped to 1 liter – thanks to Metabond M. We will test METABOND products on other vehicles and report on the results. After some initial skepticism, we are impressed with the advantages of METABOND products. We even noticed the reduced friction when accelerating after a red light – the car feels perkier. In the future we will not hesitate to use METABOND products. Impressed by a presentation of the advantages of METABOND products, we submitted our Indian Chief Classic demonstrator to an everyday test. After only a few kilometers we already observed the following positive features. As temperatures rise, we will carry out further tests. Even so, we are already impressed with METABOND’s qualities and will recommend its use to our partners.